Welcome to Connie’s “Gallery of Dolls”! None of these dolls are available for purchase they have all been sold. This gallery is just to showcase some of Connie’s previous works of art. Sit down, relax, have a cup of tea and enjoy viewing the beautiful dolls. You Can Win This Premiere Jumeau Bleuette by Connie Zink! Clearance Sale In My eBay Store! I also have an auction ending in a few hours on this adorable 8″ K&R 114. I only have one of these so if you are interested please bid now! Here is a link to the actual auction: http://www.ebay.com/itm/111606137684?ssPageName=STRK:MESELX:IT&_trksid=p3984.m1555.l2649 . There is a little over three hours left on this auction. Have a great day and watch for more specials from Land of Oz Dolls. It is Spring Cleaning Time!!!! Announcing Our Christmas Bleuette “Holiday Giveaway”!!! 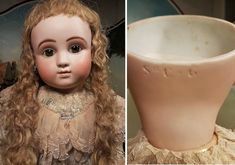 8″ and 12″ French Fashion Doll Mold and Composition Body Sale available from Land of Oz Dolls. I am currently having a special sale on the LB650S, LB90S, and LB90SP lady composition bodies and the head molds available for them. The sale will run through Thursday, November 21st. Order early to be first on the list! Orders will take approx. 2 to 3 weeks after orders are placed. 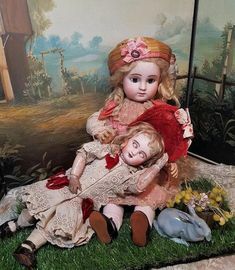 Dolls in this gallery are currently for sale. All these dolls may be purchased from this website via shopping cart buttons. My email address is landofozdolls@mchsi.com and my phone number is 815-565-0024. I do take Visa, Mastercard, and Discover along with Paypal. International shipping can be figured upon request. My shopping cart buttons do not charge for international shipping. Happy Shopping! We do ship worldwide. 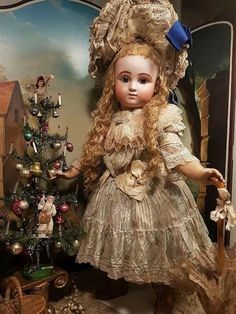 Dolls may be shipped by USPS Priority Mail, USPS Express Mail or United Parcel Service, whichever the buyer prefers or is the most economical for your destination. Buyers will pay actual shipping costs and insurance, we do not charge a handling fee. 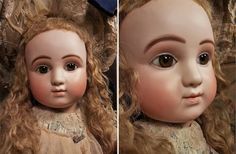 Full insurance is required on all dolls shipped within the United States. Full insurance is required to countries that will allow insurance to be purchased. Illinois residents must pay 6.5% state sales tax. Please feel free to contact us prior to purchase to discuss all of your available shipping options. Customers within the United States: We accept personal checks, postal money orders, or Paypal. Orders paid by check will be held until the check clears. Postal money orders and Paypal purchases will ship immediately. Paypal addresses must be verified, and parcels will only be shipped to the verified address on the Paypal account. You may also purchase with a credit card if you call in your order. We take Visa, Master Card, and Discover. Sorry, no American Express. International Customers: We accept Paypal with verified accounts only. Paypal addresses must be verified, and parcels will only be shipped to the verified address on the Paypal account. The full amount paid for the item will be declared on the customs form. Insurance is necessary when allowed. Please contact me within 48 hours of receipt to request a return. Once I have acknowledged the return, you will then have 4 days from acknowledgement to ship the item back to me. The item must be insured and trackable. Once the returned item is received by me, the contents will be inspected to verify completeness and condition as sent, and I will have a maximum of 4 days to refund the buyer. If an item is damaged during shipment, please contact me within 48 hours of receipt. Please keep all packing materials and the box, since many times, insurance coverage requires inspection by the issuing agent. Layaways are available. 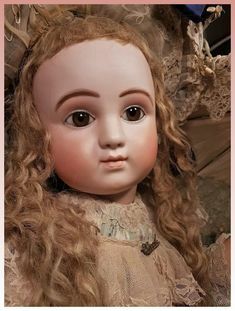 For dolls that you cannot purchase outright, please contact me and I’ll try to make the purchase possible for you through layaway. We will agree to a regular monthly payment amount, to be paid each month. Payments may be made by Paypal, credit card, or check. If you choose to send a payment by Paypal, I will send you a monthly invoice on or near the date requested. If you prefer to send checks by mail, they should be received by the due date. As each payment is received, I will contact you with your remaining balance. Shipping will be added to the final payment. Once terms are agreed on, payments should be on time and for the amount agreed. If you cannot make your scheduled payment on time, please contact me right away. On completed layaways, the return policy stated above will apply, except that a shop credit will be issued instead of a refund. The credit will be valid for a 6 month period. Layaway payments that are 30 days in arrears will be deemed as a failed layaway. A shop credit will be issued for the amount paid to date, and the credit will be valid for a 3 month period.